December 3rd, 2018 – Only in its second year, Stony Brook School of Dental Medicine’s Oral and Maxillofacial Radiology continues to gain recognition for excellence in research and education. Stony Brook School of Dental Medicine’s Oral and Maxillofacial Radiology (OMFR) advanced education program opened its doors in July of 2017 as New York’s only CODA-accredited program in this dental specialty, and as one of only ten in North America. Now, it’s gaining traction for its dedication to research and its incorporation of the latest in digital technology. The 24-month post-doctoral program provides its residents with comprehensive knowledge of the technique and interpretation of conventional and advanced imaging modalities in dentistry. Under the leadership of Dr. Mina Mahdian, Assistant Professor, the program places a strong emphasis on its research component with every faculty member and resident currently involved in ongoing projects. Recently, both Dr. Mahdian and the OMFR program’s inaugural resident, Dr. Jalal Bukhari, each received award recognition for their research on a national level. Their awards were presented at the 69th American Academy of Oral and Maxillofacial Radiology (AAOMR) Annual Session in San Antonio, Texas. Dr. Mahdian was awarded the AAOMR-XDR grant which recognizes and fosters the growth of an early career oral and maxillofacial radiologist and the future of the specialty. The grant will support Dr. Mahdian’s research project on the application of optical coherence tomography on detection and classification of dental caries. Dr. Bukhari was awarded the Dentsply Sirona Clinical Award, presented for the best poster on a clinical topic. Dr. Bukhari’s topic was carotid artery calcifications detected by dental cone beam computed tomography in patients with hypertension: a retrospective study of 1,000 patients. The successful research conducted within the program is enhanced by Stony Brook School of Dental Medicine’s dedication to incorporating technological advancements in the teaching, research and practice of dentistry. The recent acquisition of an optical coherence tomography machine supports not only Dr. Mahdian’s research, but also provides all residents and faculty members with the opportunity to utilize this new imaging device for research and clinical applications. Dr. Bukhari, who will complete the advanced education program in 2019 as the program’s first graduate, continues to make strides: he is in the process of starting two additional research projects. According to Dr. Bukhari, one research project will be a qualitative study on the medicolegal aspects of radiology report writing, and the other will be a clinical project which will involve the detection and comparison of dental cracks via multiple diagnostic modalities. 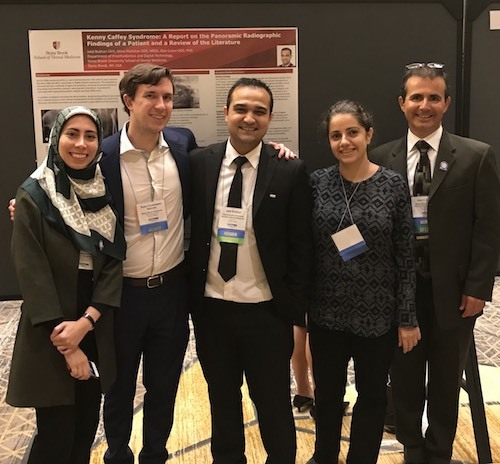 In addition to Dr. Mahdian and Dr. Bukhari’s research projects, OMFR residents Dr. Maryam Ajami and Dr. Ryan Holmes are co-piloting a study in hopes of bettering policy in their field: many CBCT scans are taken without a radiographic interpretation report resulting in incidental findings being missed, negatively impacting patients. Dr. Holmes is also currently undertaking a case report regarding rare calcifications in the head and neck and has developed an interest in dental MRI. Both Dr. Ajami and Dr. Holmes plan to conduct research projects on volume segmentation of CBCT studies for surgical treatment planning in the near future.